I was vegan for almost 7 years before finding vegan baklava for the first time, and when I did, I ate two entire tubs of it in 24 hours. I have a problem, and that problem comes in the form of flaky layers of phyllo dough, cinnamony walnuts, and sticky sweet honey(-less) syrup. Thankfully, my homemade vegan baklava is a little bit lighter. And in response to reader requests, I’m including a few step-by-step photos of the filling and assembly, which will hopefully make your life a little bit easier too. I first found plant-based baklava in western Pennsylvania of all places. First, I was eating with friends at B52 cafe in Pittsburgh (which remains one of the best, if not the best, vegan meals I’ve had EVER) when I sampled some for dessert. Then, the next morning, my boyfriend and I were driving back to Baltimore and decided to stop at Cafe Verve in State College on our way home. Lo and behold, there on the counter was MORE vegan baklava. I finished all of it and absolutely made myself sick and I’m pretty sure he had to drive the rest of the way. Those experiences made me realize that butter is so not essential to making a delicious baklava. It’s all about the cinnamon spiced nuts, crispy dough, and nicely flavored syrup, all of which can easily be achieved without any animal products. Most commercial phyllo (filo) dough is already vegan. Probably because oil is cheaper than butter, but no matter the reason, I’ll take it. Light olive oil for brushing the dough. 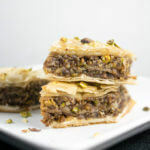 A mixture of walnuts and pistachios in the filling; these are simply my favorites. A quick swap of agave nectar for honey in the soaking syrup. Gentle hints of citrus and cloves in both the syrup and filling. I use a higher ratio of filling to pastry than your standard baklava. Of course, you can customize it to your liking. Just be warned. Working with phyllo dough is always fussy. It will break, it will tear. It will get everywhere when you slice up the vegan baklava after baking it. It will test your patience. This recipe is not for the weak of heart, but at the same time, it’s very forgiving (it’s not like you can’t eat cracked filo), so go boldly forth and enjoy! 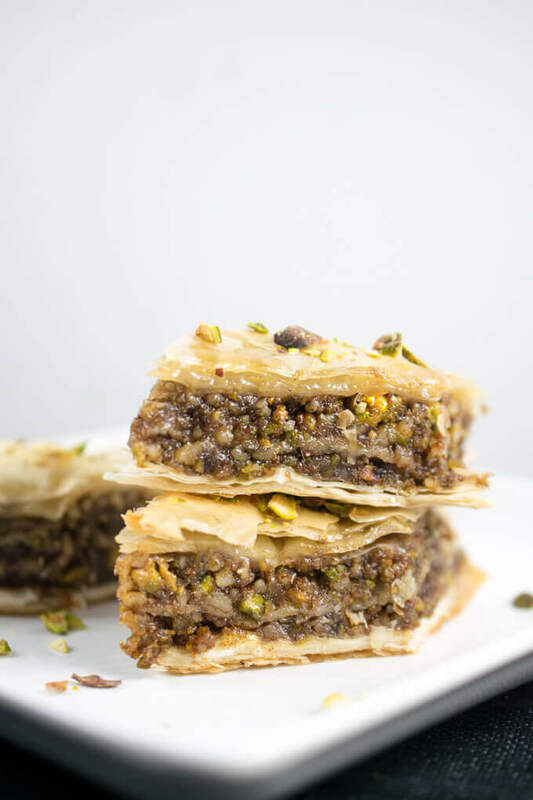 Sweet, spicy, flaky vegan baklava! You'll never miss the dairy or honey in this plant-based treat. Before doing anything else, make sure that you have thawed your phyllo dough according to package instructions. Start by making your syrup so that it has time to cool while the vegan baklava bakes. Add all of the ingredients to a small saucepan. Bring it to a boil and then immediately reduce it to a steady simmer. Cook for 15-20 minutes, or until reduced in volume and thick enough to coat the back of a spoon. Remove from the heat and set aside to cool. Remove the cinnamon stick and cloves if used. Meanwhile, make the filling. Pulse the pistachios and walnuts in a food processor until crumbs are formed. Add the cinnamon, lemon zest, and orange zest, ground cloves, nutmeg, and salt if using. Stir, then add the maple syrup and stir again to combine everything. Preheat the oven to 350 degrees Fahrenheit. Lightly grease an 8-by-8-inch baking dish, or similar sized dish. Open your phyllo dough. If you are buying a usual 16-oz box, it will have two rolls of dough inside, and you only need one of them. Gently unroll the dough, and trim it to the size needed to fit your pan. For my 8-by-8 pan, I sized it by cutting the entire stack of dough in half and then trimming a little bit off of one edge. Get a damp kitchen towel and use it to cover the dough to keep it moist. Add approximately 3 sheets of dough at a time to your pan. Brush with a very light coating of olive oil and continue. Do this until you have used about 1/3 of the sheets. Sprinkle 1/2 of the spiced nut filling onto the dough. Gently spread it out into an even layer as best you can without tearing the dough too much. Continue layering and oiling sheets of dough until you have used approximately 2/3 of the sheets. Add the remaining half of the filling at this point, and finally, continue with the remainder of the dough. 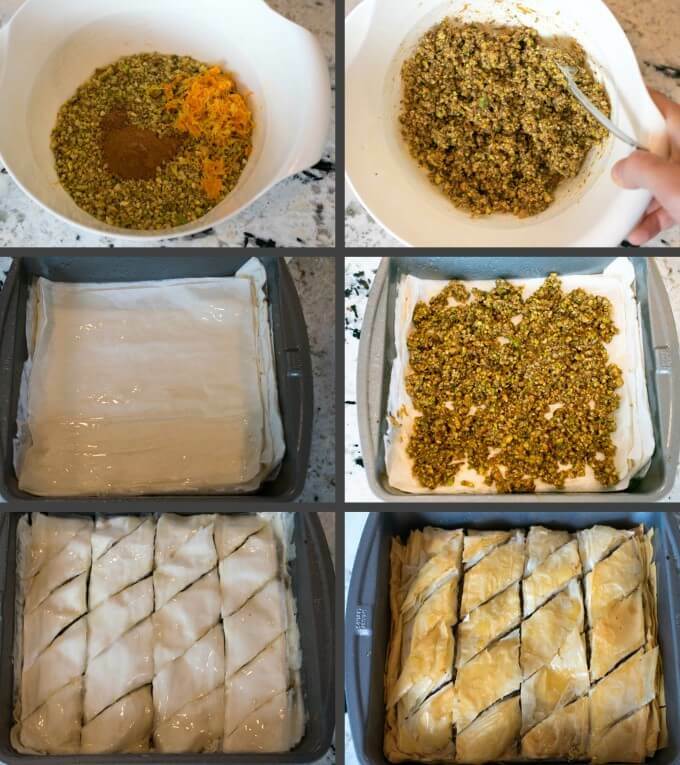 After lightly brushing the top layer of dough with oil, use a sharp knife to cut the baklava into pieces of your choosing (I went with a diamond pattern as seen here). Be sure to cut all the way through to the bottom of the pan. Bake uncovered for approximately 25-28 minutes, or until nicely browned on top. Immediately after removing the baked vegan baklava from the oven, pour the syrup evenly over it. Try to get some of it it in all of the different cuts so that it can soak through to the bottom. Let cool to room temperature before slicing and serving. Leftovers can keep in an airtight container in the refrigerator for a few days, or frozen. NUTS: You can mix and match pistachios, walnuts, and almonds in whatever ratios you prefer to reach about 2 cups total. SWEETENER SUBSTITUTES: You can substitute maple syrup for agave and vice versa, if desired. Agave is slightly sweeter so adjust the quantity slightly to accommodate. OLIVE OIL: This is best with light tasting olive oil, not grassy extra-virgin olive oil. If you only have super flavorful olive oil, use a 50-50 mixture of olive oil and a neutral vegetable oil like grapeseed, to tone down its flavor a little bit. You can also use melted vegan butter if you're into that sort of thing. I made these with honey instead of agave and maple syrup – not vegan, sorry. However, I otherwised used your instructions and they are freaking perfect! Wow. 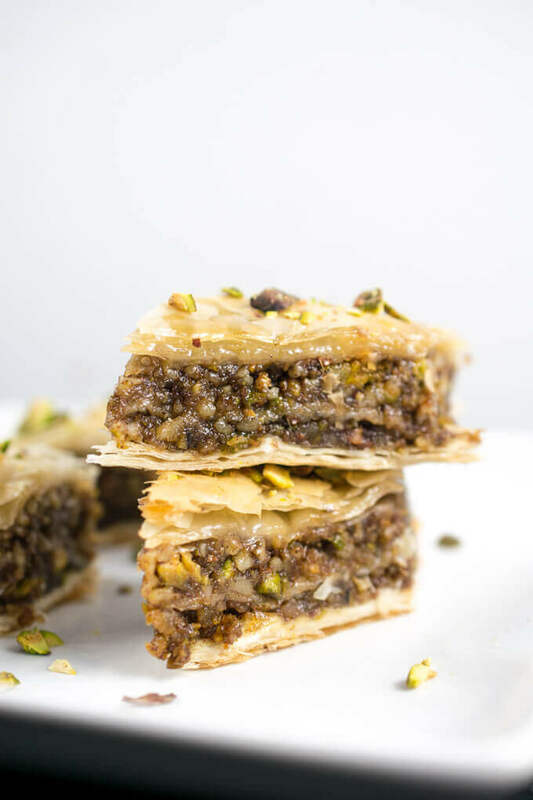 Great to know I can make this when I’m craving baklava since it’s impossible to find a dairy free version anywhere, but this is just as good as anything from a store. I had high hopes for this recipe and I was satisfied with the result. I shared it with some friends that are lactose intolerant and everyone really enjoyed it.I’m comfortable passing on the recipe because the ingredients are easy to find and the instructions are clear to follow. I wanted to thank you for this recipe, Shannon. Like you, baklava was one of my favorites and something I didn’t expect to eat again once I became plant-based. 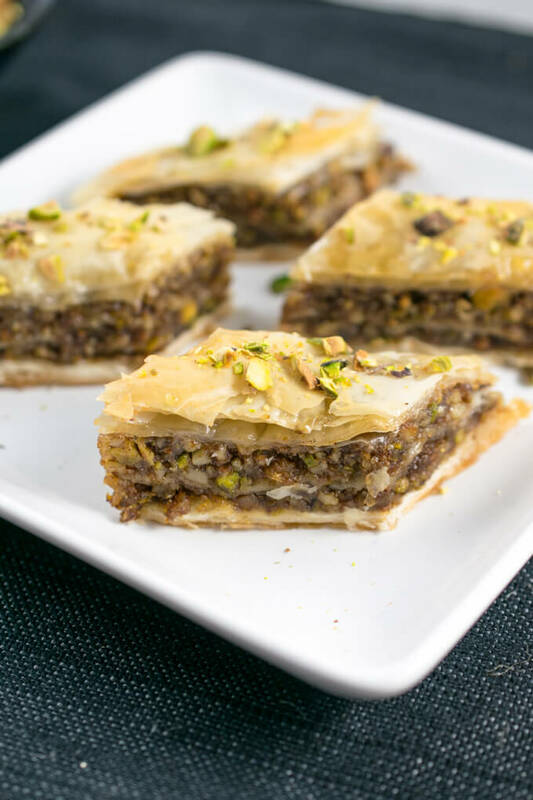 I never would have expected to be able to use store-bought dough and olive oil, but after finishing off every last piece of the baklava, we are convinced this is as good as the “real thing”. Thank you for giving us a wonderful recipe and fun weekend kitchen project, and for the pictures to help show the process and remind us that even you are not “perfect”.